Jeep is known for its extreme capability and limitless excitement, and the new 2018 Jeep Grand Cherokee is no exception. You can find the most awarded SUV ever now at Southern Greenbrier Chrysler Jeep. The 2018 Grand Cherokee offers a bevy of optional engines, ranging from efficient to exhilarating, beginning with a standard 295-horsepower 3.6L V6, which achieves an EPA-estimated 26 highway MPG. For a pump in power, opt for the optional 5.7L HEMI® V8, which kicks out 360 horsepower and 390 lb.-ft. of torque for a max towing capacity of 7,200 pounds. The new Grand Cherokee also offers a 3.0L V6 EcoDiesel engine and 2 performance engines, including an SRT® 6.4L HEMI® V8 and a 6.2L HEMI® SRT V8 that fires off 707 horsepower and 645 lb.-ft. of torque. Find your 2018 Jeep Grand Cherokee today at Southern Greenbrier Chrysler Jeep, serving Chesapeake, Suffolk, Portsmouth and Virginia Beach, VA, as well as Elizabeth City, NC. The new 2018 Jeep Grand Cherokee isn't a 1-size-fits-all SUV. With 11 total trims, there's a sure fit for everyone. You won't find that kind of versatility in the 2018 Toyota 4Runner or Ford Explorer. It's everything you've come to expect from the IHS Markit winner for highest model loyalty in the non-luxury mid-size SUV segment, for the fourth year in a row. If you're looking for off-road adventure, drive the Trail Rated® Grand Cherokee Trailhawk®. For thrills around the race track - yep, there are race-inspired SUVs now - drive the Grand Cherokee SRT® or 707-horsepower Grand Cherokee Trackhawk. 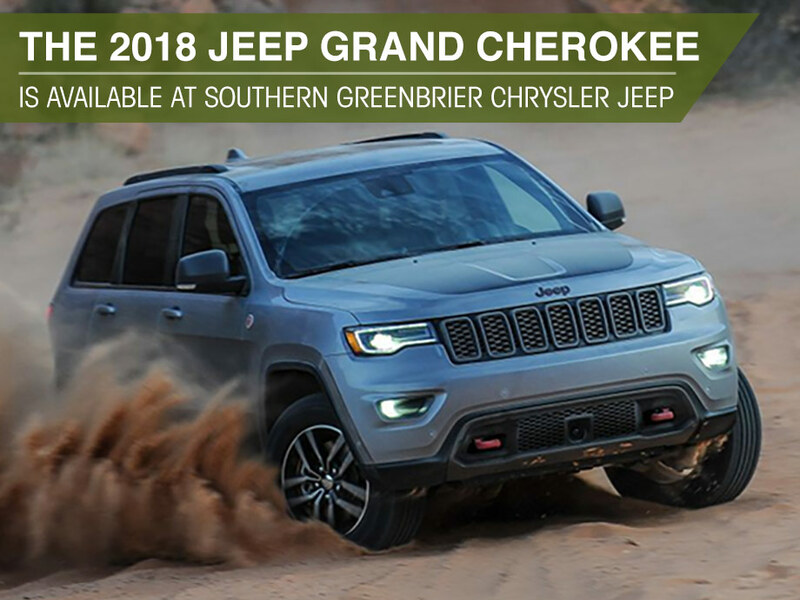 Find a 2018 Jeep Grand Cherokee that's equipped for you at Southern Greenbrier Chrysler Jeep. The new 2018 Jeep Grand Cherokee offers over 70 available safety and security features, ensuring every adventure is a good one. The new 2018 Jeep Grand Cherokee also offers a ParkView® Rear Back Up Camera and Dynamic Gridlines. For a safe family SUV, visit Southern Greenbrier Chrysler Jeep today. The new 2018 Jeep Grand Cherokee offers a collection of today's cutting-edge cabin technology, from available Blu-ray rear seat entertainment to smartphone integration. All of the most in-demand technology comes standard in the Grand Cherokee, including Apple CarPlay™, Android Auto™, Integrated Voice Command with Bluetooth® and Jeep's Uconnect® 4 interface with a 7-inch display. Drivers can also opt for Uconnect® 4C NAV for integrated navigation, for an easy way to get around Chesapeake, Suffolk and Portsmouth, VA. Visit Southern Greenbrier Chrysler Jeep near Virginia Beach, VA and Elizabeth City, NC, and test-drive the 2018 Jeep Grand Cherokee today.